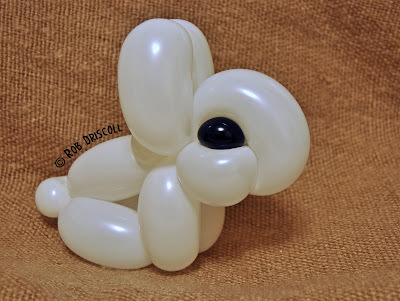 I originally was meant to do another balloon for a friend today but I am currently away and it's a bit difficult to do so I will do that balloon design soon. Have I really done 4 rabbits all ready this year? yes I have and I expect I have more to come as well. This rabbit is made from just 2 balloons (or 1 and a scrap of black), they are both 260s and its pretty easy to make taking a couple of minutes, I think it looks a lot more life like than some of the other rabbits I have made so far this year.